A guidebook to walking the The Tour of Monte Rosa, a 9-10 day, 134km trek circling Monte Rosa anti-clockwise from Zermatt. 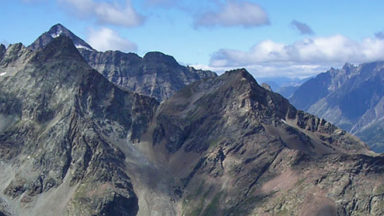 The high route hugs glaciers and has views of over ten 4000ers. All essential information is provided, including outline maps, route profiles, advice on glacier crossing and accommodation. Although only one section of the trek is on glaciers, the trails are often high and late lying snow can remain on shady slopes well into July. High summer is the ideal time for this trek, and earlier or later some slopes could be quite dangerous for walkers. The trek is ideal for keen hillwalkers who enjoy rocky terrain, long days and who have a sense of adventure. The one glacier crossing is easy doesn't require technical skills other than being able to walk on gentle terrain in crampons and knowing how to stay safe. Regular hiking gear will do the trick but a rope, harness and crampons could be required for the glacier section. Monte Rosa peaks, including the east face (highest wall in the Alps) and other summits - Lyskamm, Matterhorn, Theodule Glacier, Walser culture, alpine culture in Switzerland and Italy. Col Turlo - ancient route now remade by the Italian alpine. Fauna - especially the ibex. High alpine flora - notably the King of the Alps. This guidebook to walking the Tour of Monte Rosa, explored the Italian-Swiss border region in an 8-stage trek, starts and finishes in Zermatt. 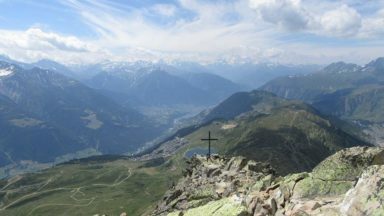 Along the way, the Alpine trail takes in spectacular views of the Monte Rosa massif, including ten 4000m summits, as well as breaks in mountain huts and the towns of Resy, Saas Fee, Macugnaga and Cervinia among others. The guidebook also provides a wealth of practical information on the area, travel, and the best way to tackle the trek. Situated on the Swiss Italian frontier, the Monte Rosa massif is the largest massif in western Europe. 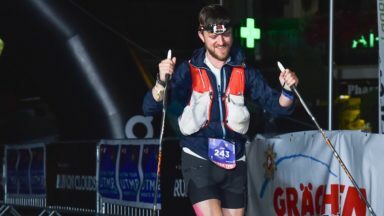 The Tour of Monte Rosa is an adventure, challenging and very varied, taking a high route around the massif, hugging the glaciers on several stages. As the tour passes through areas of true wilderness, walkers will experience a sense of remoteness rarely found in the Alps. The spectacular scenery is not all that the Tour of Monte Rosa offers: the contrast between the Swiss and Italian sides of the range adds immeasurably to the whole experience and walkers are advised to take the time to explore some of the charming hamlets and villages found en route and to savour fully the different gastronomy, history and culture that make up this alpine region. 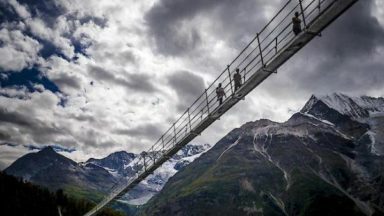 The Europa Bridge installed last year after the Europahutte allows the option to do the EUROPAWEG (Stage 8 now ). This is a 494m long suspension bridge which is said to be the world’s longest pedestrian suspension bridgea which hangs some 85m above a ravine. The Europaweg seems to be undergoing more changes. 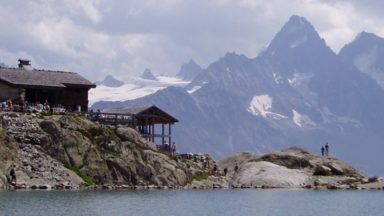 Please note that in the latest Tour of Monte Rosa guidebook the author advises against the Europaweg and recommends the alternative valley route. The Europaweg is no longer being checked by Hilary Sharp. The section of Europaweg 1km south of Europahutte seems to be permanently closed, and no longer appears as waymarked footpath on maps. This trail does often change so, to avoid any confusion, please check on the Europaweg website before you go. This is just to let you know that my wife and I got back from the Alps a few days ago having completed the Monte Rosa round earlier this month, and we found your guide invaluable, so thanks for the work you put into it. We're now confirmed Alpine trekkers, we had an amazing time! 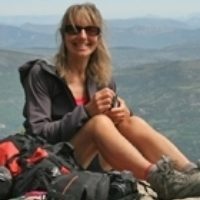 Hilary Sharp is British, a qualified Accompagnatrice en Montagne (International Mountain Leader), and is based permanently in France. After 23 years living in the Alps she now lives in northern Provence, within easy driving distance of the southern French Alps. She runs her own trekking business, Trekking in the Alps and Provence, guiding walks in winter, spring and summer (hilaryalp@gmail.com; www.trekkinginthealps.com; www.trekkinginprovence.com). Her love of walking and climbing has taken her to many parts of Europe and further afield. Hilary occasionally contributes to British walking magazines and is author of Trekking and Climbing in the Western Alps (New Holland, 2002). New Europaweg bridge - A Bridge too far?